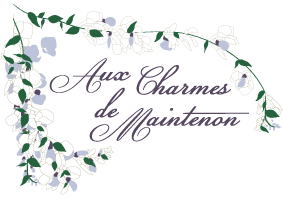 The guest house “Aux Charmes de Maintenon” ensures through its partner Novaresa ( booking module provider ) optimal security measures against loss, misuse and alteration information entrusted to it by Internet users. If you are a registered user and you upload images to the website, we advise you to avoid uploading images containing EXIF ​​GPS coordinates. Visitors to our website can download and extract location data from these images. Articles on this site may include embedded content (eg Youtube videos, images, articles …). Content embedded from other sites behaves in the same way as if the visitor were to that other site. Google will use this information for the purpose of evaluating your use of the site, compiling reports on website activity for its publisher and providing other services relating to website activity and use of the site. ‘Internet. ​​If you leave a comment, the comment and its metadata are kept indefinitely. This automatically recognizes and approves the following comments instead of leaving them in the moderation queue. ​​If you have an account or have left comments on the site, you can request to receive a file containing all the personal data that we have about you, including those that you have provided us. You can also request the deletion of your personal data. This does not take into account data stored for administrative, legal or security purposes. ​​Visitor comments can be verified using an automated spam detection service. ​​Your personal data, which are likely to pass through this site, use the HTTPS encryption protocol and are hosted at OVH. In accordance with the laws governing the ownership of literary and artistic rights or other similar rights, all elements, marks, names, photographs, drawings, models, logos, graphics, color codes, etc. in the present site are the exclusive property of the entities concerned of “Aux Charmes de Maintenon” or its partners or suppliers, this one or those granting no license, nor any other right than that to consult the site. The reproduction or use of all or part of these elements is only authorized for the sole purpose of information for personal and private use, any reproduction and any use of copies made for other purposes being expressly prohibited. Any other use is constitutive of counterfeit and sanctioned under the Intellectual Property, except prior authorization and written by “Aux Charmes de Maintenon”. Hypertext links may link to other sites than this site. “Aux Charmes de Maintenon” has no control over the contents of said sites and disclaims any liability in the event that this content violates the legal and regulatory provisions in force.